TWO US Marine Corps jets have been forced to drop four unarmed bombs on the Great Barrier Reef. 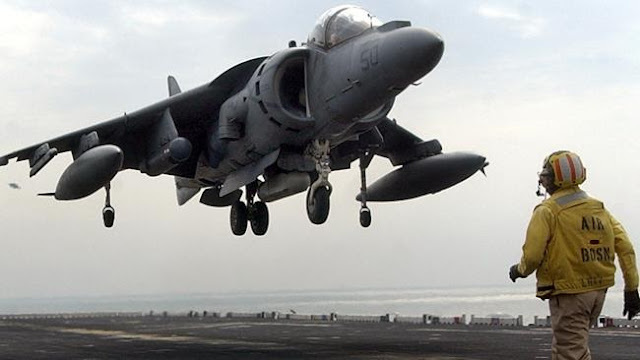 The two AV-8B Harrier jets each dropped two 226kg bombs on the world heritage-listed reef in an emergency jettison during a training mission on Tuesday. The incident came ahead of Exercise Talisman Saber, a biennial training operation between Australian and US forces based at Shoalwater Bay on the central Queensland coast. The dropped bombs had not detonated and a US official has reportedly said the chance of any of them exploding is "extremely remote". The Great Barrier Reef Marine Park Authority told News Corp Australia they had not heard about the incident, but would look into it. The extent of any environmental damage was not clear. NBC News reported the jets had planned to drop the bombs on a range on Townshend Island, but that was foiled when the range was not clear. After several attempts, the jets were running low on fuel and could not land with the bombs they were carrying. "They chose to save the aircraft," an official told the US news channel. The Australian Defence Force confirmed the events and said the bombs posed "minimal risk or threat to the public, the marine environment or civilian shipping transiting the reef area". "The incident is being investigated by the US and findings will be provided to the Great Barrier Reef Marine Park Authority so that the way ahead can be mutually agreed," a spokesman said. "Defence is working closely with the US military, the Australian Government and environmental organisations to ensure there is no danger to the public or the environment now or in the future." The Great Barrier Reef is the world's largest coral reef. It is home to more than 3000 individual reef systems and hundreds of tropical islands. The US Navy is planning to recover the bombs, which were dropped in a "deep channel" about 16 nautical miles south of Bell Cay, off the Capricorn Coast between Mackay and Rockhampton, according to NBC.